Single-load laundry detergent pods are convenient for parents. That is an absolute fact. But there is an inherent risk when children are involved. In the first six months of 2015, poison-control centers nationwide received 6,046 reports of kids 5 and under ingesting or inhaling pods, or getting pod contents on their skin or in their eyes, according to the American Association of Poison Control Centers (AAPCC). The number was as high as it was because adults let children have access to their laundry supplies – keeping their detergent out in the open or on top of their dirty load for convenience. It was a learning curve for all and parents all over the world have changed the way they view laundry storage making it a safety priority just as they do with all cleaning supplies. P&G heard these stats and as a maker of laundry packets, they are making significant changes as part of their commitment to further reduce accidents. Of course, as a number one rule, all detergent should be kept out of reach of children. You’ve probably seen the campaign Tide recently launched to encourage their customers to keep their Tide Pods UP and CLOSED in order to help keep children SAFE. All Pod packaging includes this information right on the box. I love the extra reminder. The company has been working tirelessly to better their product and to add extra “checks” to ensure that just in case a baby did get a hold of the Tide Pod container, it wouldn’t be easy to access. 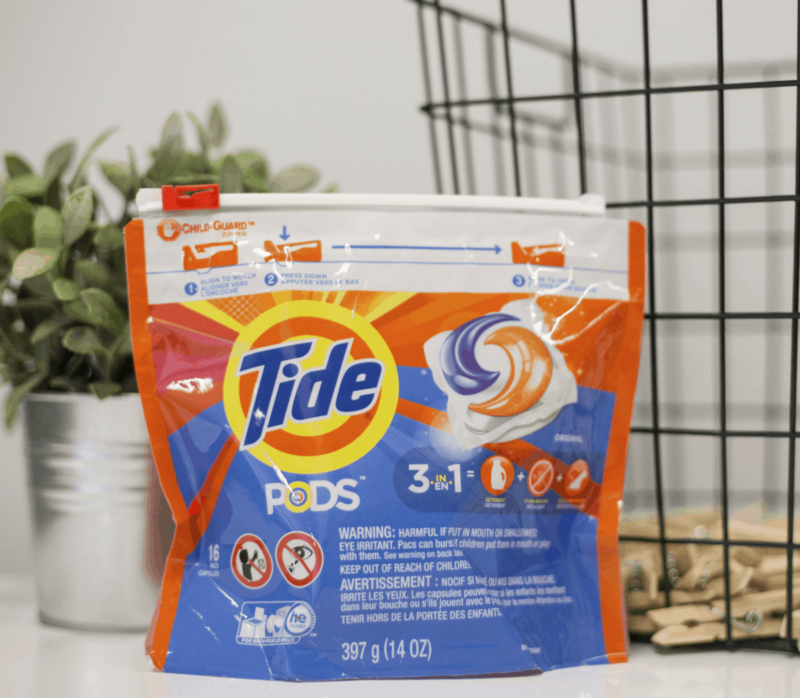 In recognition of June – National Safety Month – Tide has announced their newly-designed child-resistant packaging. The new bag with a Child-Guard zipper passed stringent child resistance tests outlined in the Poison Prevention Packaging Act and provides the same high standard of protection commonly available on medications and other household cleaners, such as bleach. I am so thankful that the product I use to wash my clothes now has another layer of protection added just in case I make a mistake and my children get a hold of the container. The child-resistant bag isn’t the only protection in place. There’s a few more, that when all combined, makes me feel so much more comfortable. A difficult-to-open tub, (when this released, Tide saw a decrease in incidence rates by almost one-third). The best measure of protection is to treat liquid laundry packets like other household cleaning products and keep them away from children. There’s no better way to say this. I know that your washing machine has a bottom drawer and it’s convenient to place things in there – but don’t use it. You need to keep all your laundry products UP and AWAY from your children. I’m actually not even sure why the washer and dryer community hasn’t caught on with this by now. The machines need to be redesigned with locks. Where do you keep your laundry products? Do you have them up high and away from your children? After reading this information, did it change your thoughts about storage? *I’m part of the Tide Fabric Care Advisory Board. All opinions are my own. Totally agree with you. Laundry detergent and other cleaning materials should be kept away from children. I love that Tide Pods’ capsule formulation has the safety of the kids in mind. I love that Tide has extra protection in place with their pods. I know how kids get in to everything, but it’s so important to keep them high and out of reach! I love the idea of a child resistant bag. Even though these bags should be out of children’s reach to begin with, kiddos do make it a point to get into things that the shouldn’t. This is great because so many kids are curious enough to eat things like this. I love that they are making them more safe. We always keep our detergent high and away from little fingers but its good to know if they ever did find them, the bag is designed to be child resistant.